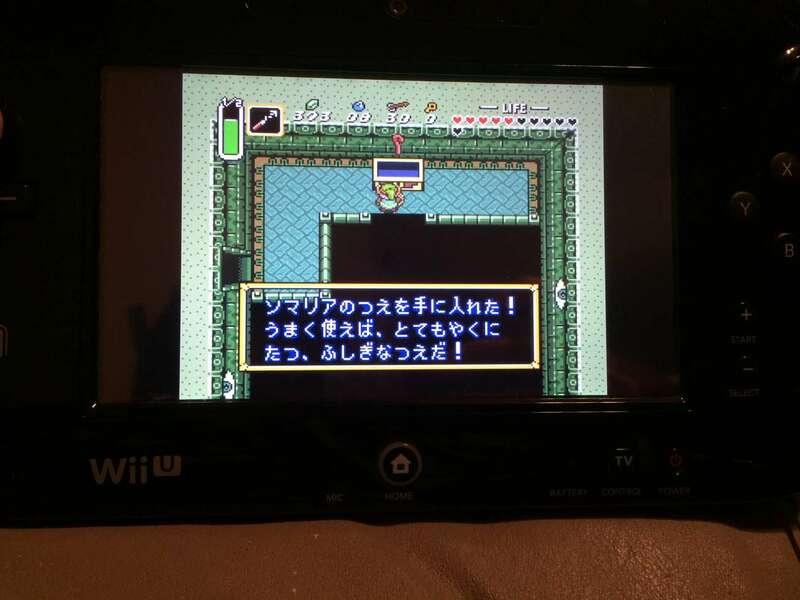 A few years ago, I heard a rumor about The Legend of Zelda: A Link to the Past – that the “Cane of Somaria” was quietly renamed the “Cane of Somasoa” in the Japanese Game Boy Advance version. Is the rumor true? If so, why’d the name change? And is it only “Somasoa” in the Game Boy Advance version, or has it been “Somasoa” in Japan ever since? Surprisingly, my research into the matter led to a larger, weirder mystery than I originally expected. 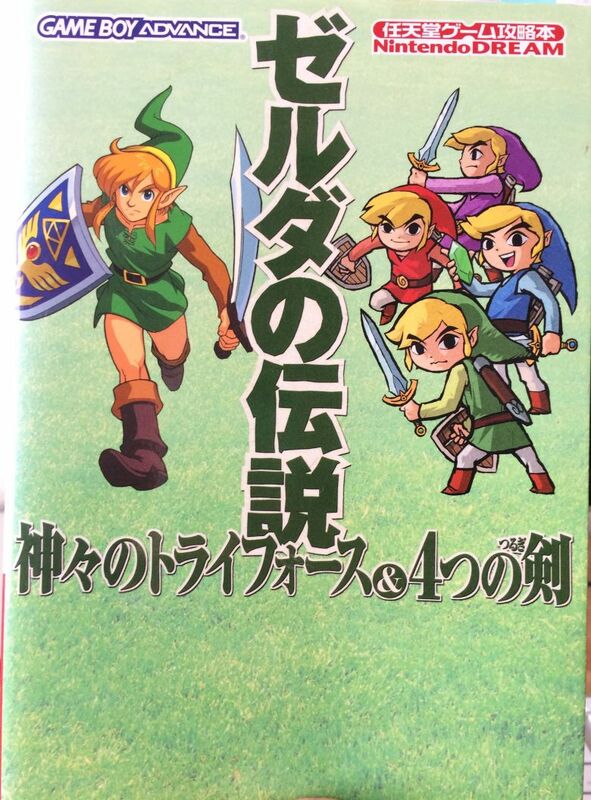 In this article we’ll look at this Somasoa rumor, examine two common theories about the name change, check lots of Japanese re-releases and strategy guides for more info, and try to get to the bottom of the mystery. 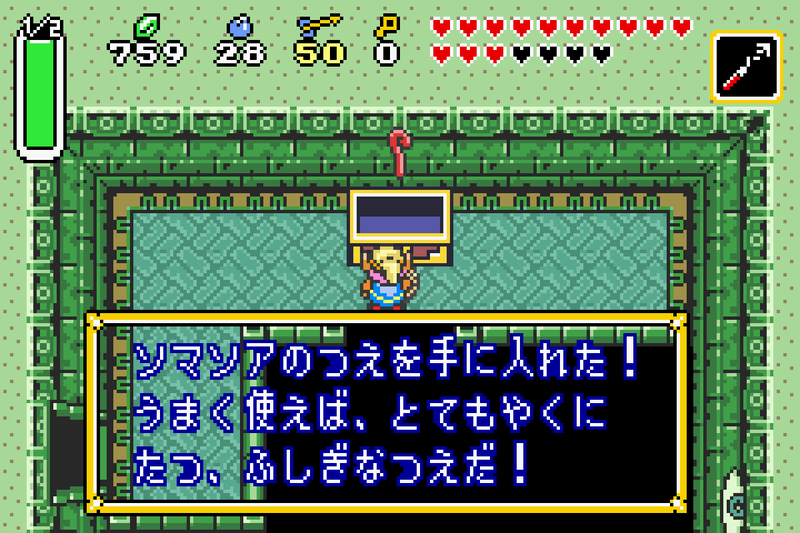 Toward the end of A Link to the Past , Link finds an item called the “Cane of Somaria”. When used, it creates a block out of thin air that can be pushed or thrown. 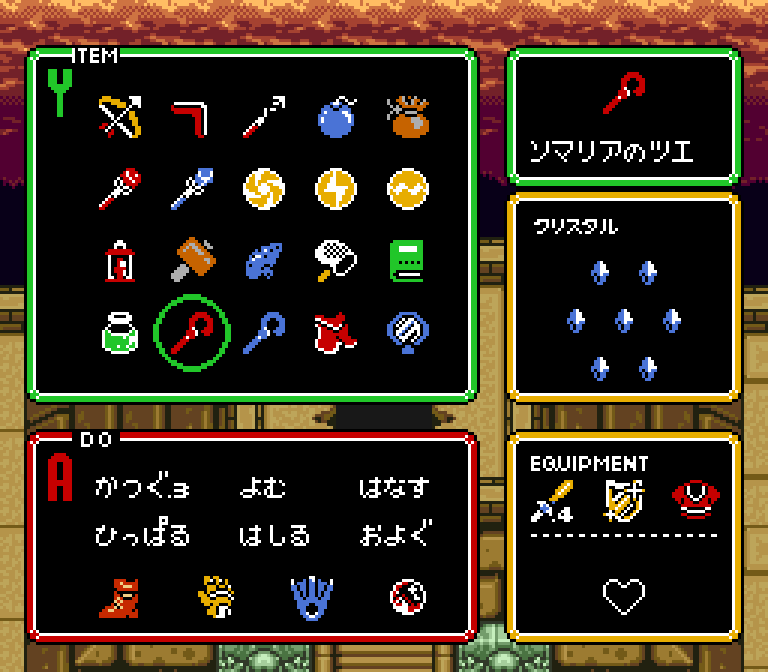 And if you beat the secret GBA-only dungeon, the cane is called the "Cane of Somasoa" right there in English! The “Cane of Somaria” has indeed become the “Cane of Somasoa” – in three different places and in two different languages, no less! Nintendo has never officially commented on this name change, so fans have come up with two main theories about it. 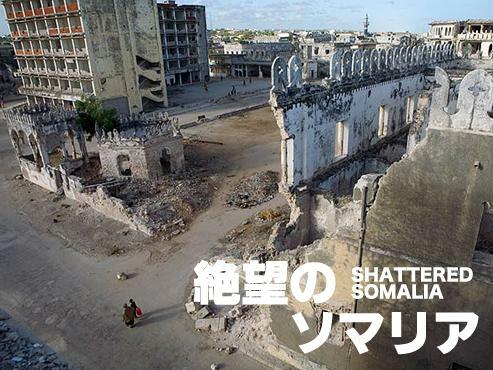 Because of the infamous L and R problem in Japanese, the word ソマリア (somaria) can be written as “Somaria” and as “Somalia”. So some fans suggest the name was changed because unintentionally referencing the recently war-torn Somalia in a lighthearted video game would’ve been in bad taste. So this theory suggests that someone misread the name during the GBA game’s development and it just stuck. One mistake is understandable, but three different mistakes all in separate areas of the game’s programming is surprising. Surely someone would’ve said something, between all the developers and the quality control guys, including the prestigious Super Mario Club. Or maybe someone did say something and it wasn’t considered important enough to fix? Originally, I had only planned to discuss the theories in this article, but I decided to do some research of my own to help clear things up as much as possible. 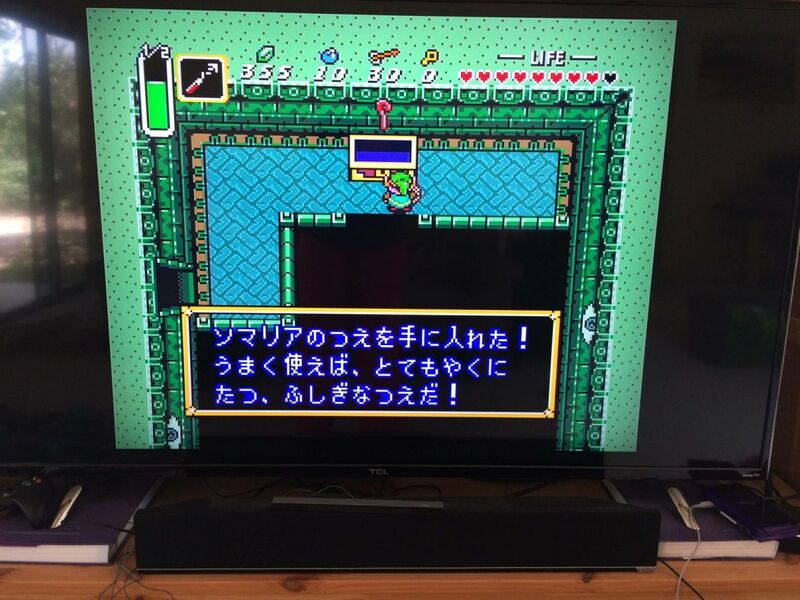 The first logical step was to check all the other Japanese versions of A Link to the Past . 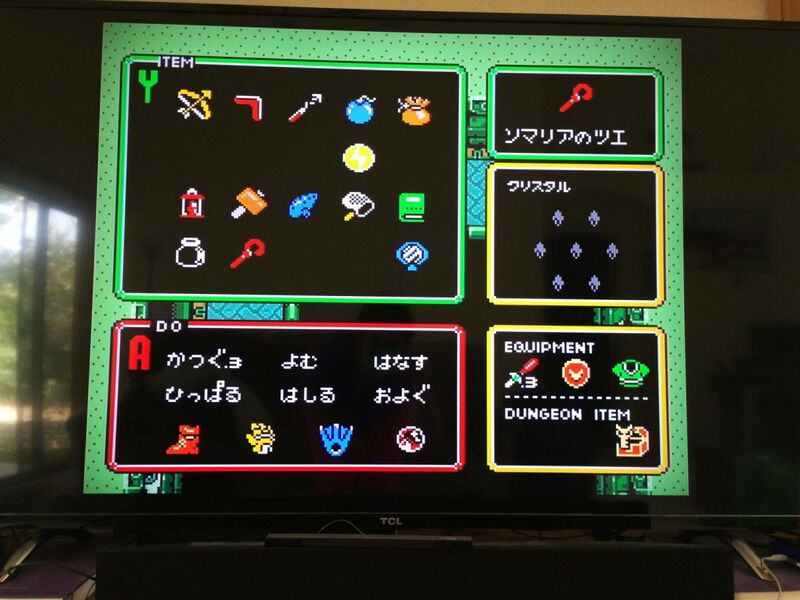 Because of all this, the only way to be 100% confident is to play every version up until Link gets the Cane of Somaria. 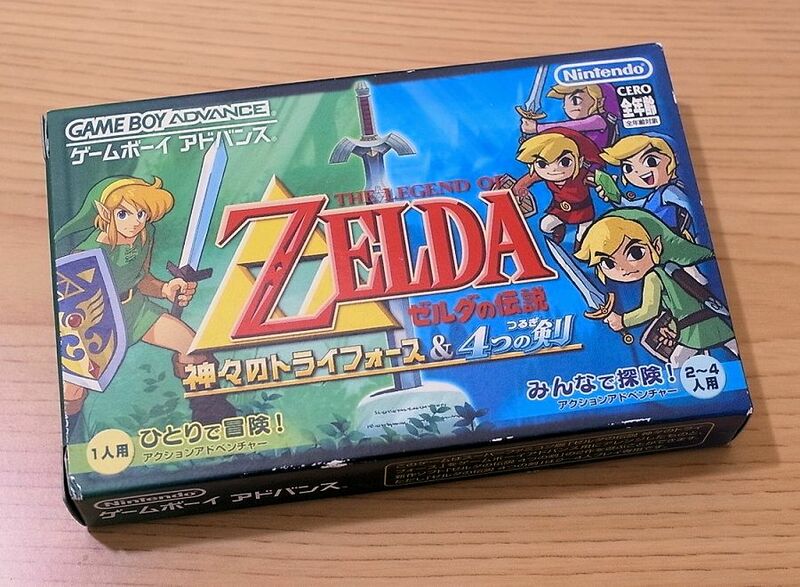 The Japanese version of A Link to the Past was re-released on the Wii Virtual Console in December 2006. After a few hours of playing, we see the item is back to being called the “Cane of Somaria”. 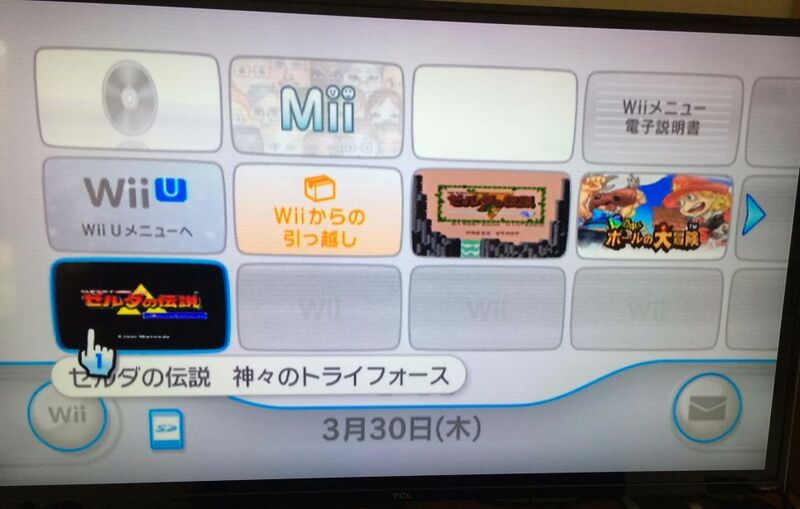 The game was re-released again on the Wii U Virtual Console in February 2014. 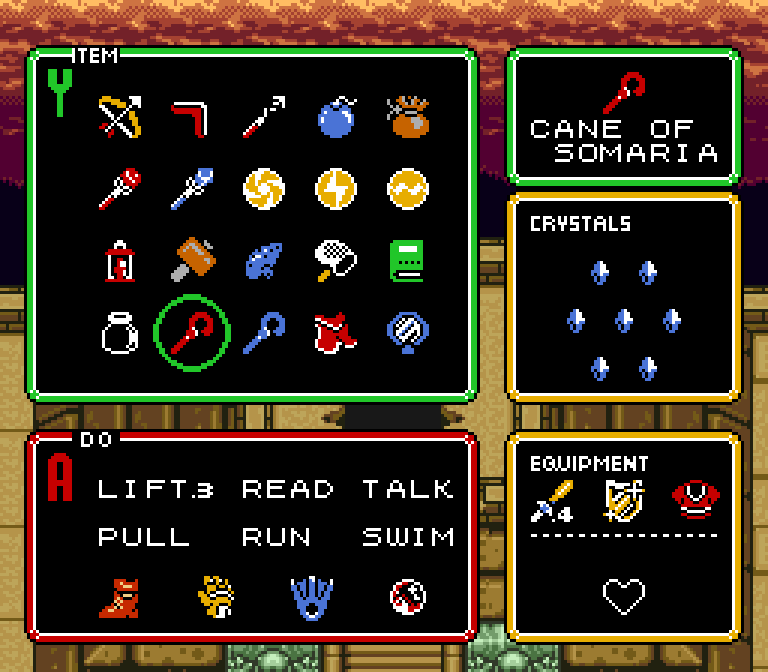 After playing far enough into the game, we see the item is called the “Cane of Somaria”. The Wii U Virtual Console version calls it the "Cane of Somaria"
The game was re-released yet again in March 2016 on the New 3DS’ Virtual Console. I don’t own a Japanese New 3DS and can’t really justify spending $200 to import one for this article alone, so I can’t confirm anything with this version yet. 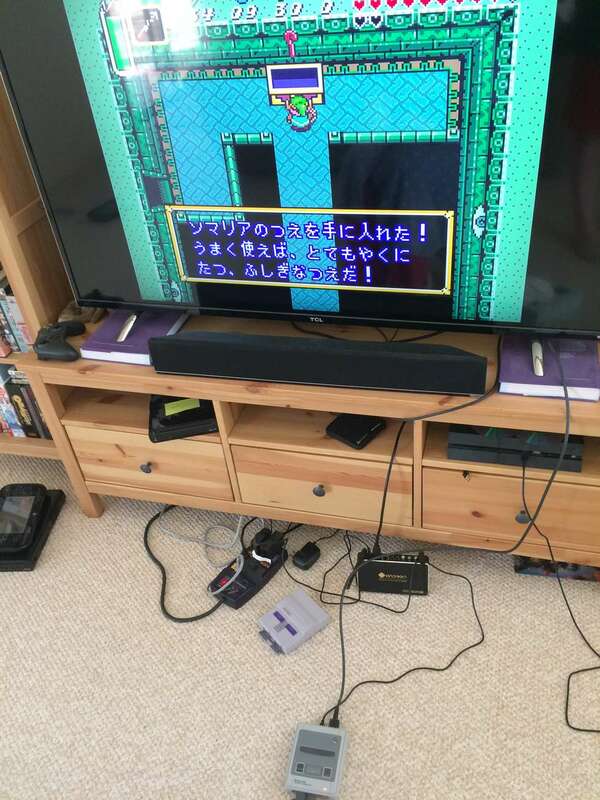 The Japanese version of A Link to the Past saw a re-release in October 2017 on the Nintendo Classic Mini: Super Famicom. It was one of 21 games available for the standalone system. As expected, the cane item is still called the “Cane of Somaria”. I almost forgot that the game saw a re-release way back in 1997 via Japan’s Nintendo Power service, which is unrelated to the Nintendo Power elsewhere. 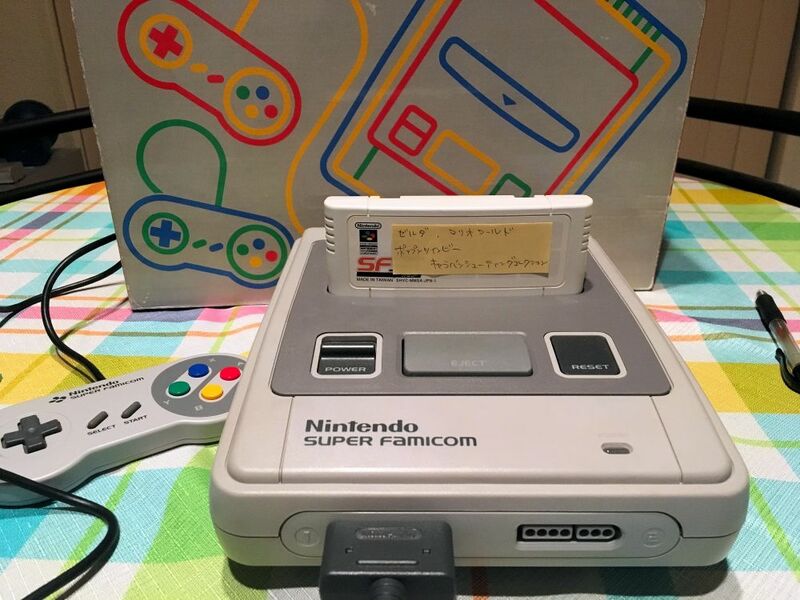 Basically, you could download Super Famicom games onto blank cartridges at shops for a smaller fee than buying the full, normal release. If you’re interested in some more details, Poe and I streamed our Nintendo Power Somasoa% run here. You can even get a peek at the Nintendo Power cartridge OS in action. After personally checking every current version of the Japanese version of A Link to the Past that I could, it appears only the Game Boy Advance version uses the name “Cane of Somasoa”. 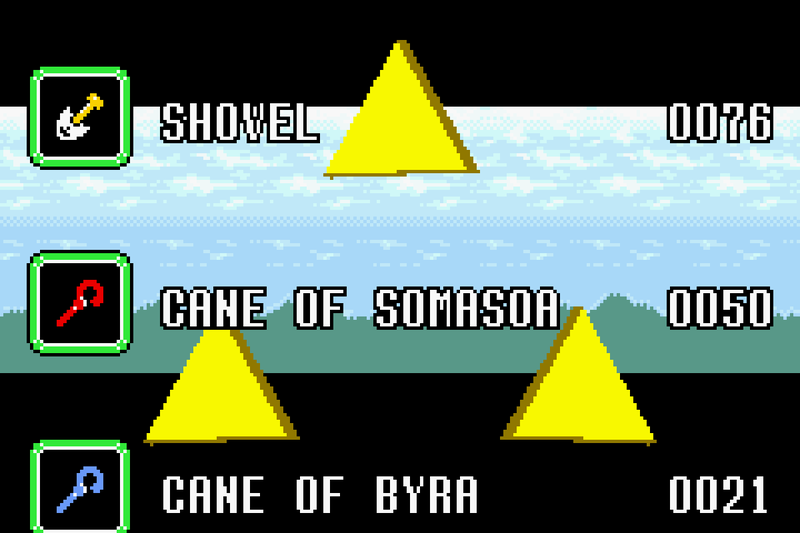 It seems only the GBA version uses the “Cane of Somasoa” name… but the fact that it’s spelled that way in three separate parts of the game’s programming is still very odd. Normally I’d chalk it up to being a persistent typo, but this time feels different. 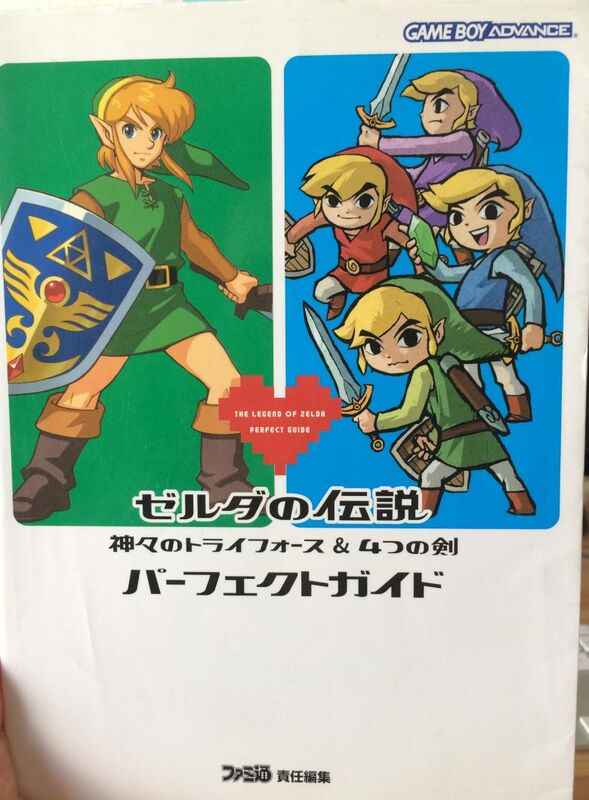 With that in mind, I imported the three main Japanese strategy guides for the GBA version of A Link to the Past . Whoa! The item is called the "Cane of Somasoa" here! And here! What the heck?! Wow, I wasn’t expecting that at all. 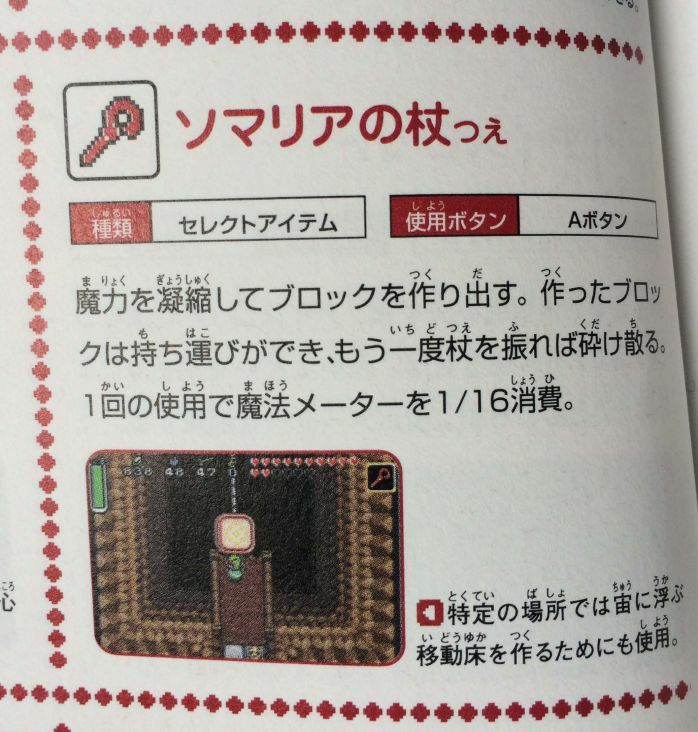 Did only the official guide team get a memo about the new name, or did the Famitsu and Nintendo Dream people purposely put “Cane of Somaria” back in after noticing the mistake? 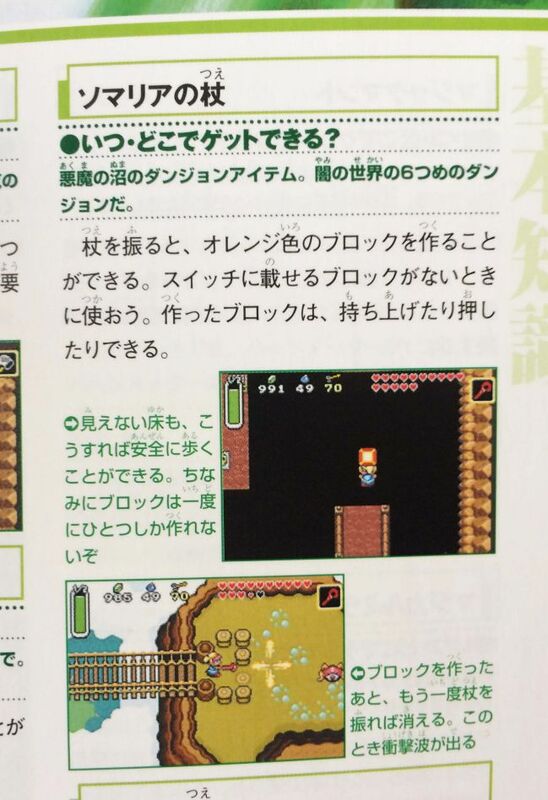 It’s clear the unofficial guide writers had access to the full GBA game, so they surely saw the “Somasoa” name too. I picked up these guides to help solve the original mystery, but now there’s just a new one added to the pile! 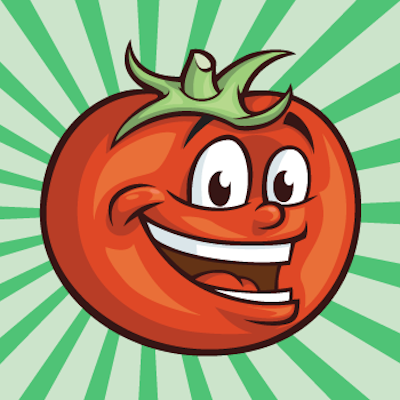 Unless Nintendo makes any official comments on the Somaria/Somasoa name change, I don’t think the mystery will ever be fully solved. I feel like the Somalia theory is pretty weak, but it also seems weird for the “Somasoa” typo to happen in so many different places and only in Nintendo’s strategy guide. When A Link to the Past was ported to the GBA, all sorts of little things got changed. 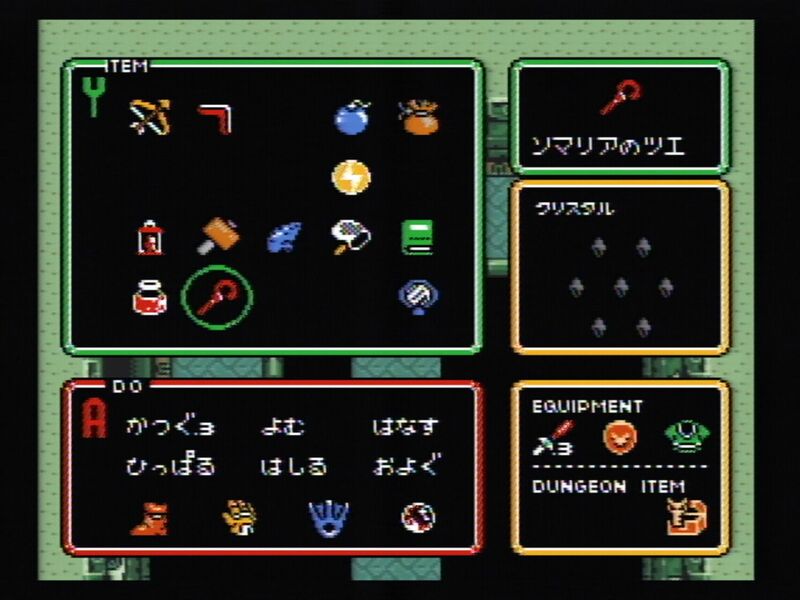 Some changes were obvious: Link shouts every time he swings a sword, menus had to be compressed, etc. Uu… Link, you’re the one person I didn’t want to involve in this… Kah… That voice… Is that you, Link? I told you not to leave the house, and yet… I told you to wait at home. …T-take this sword and shield and go. In that case, take this sword and shield. I will teach you the special sword technique that’s passed down among the clan of knights. Listen well… Hold the B Button to fill the sword with power. Listen carefully… Hold the B Button to build power in your sword. Do so, and you should be able to use the secret sword (technique) only passed down in a certain clan… Let go and that power will manifest itself. Rescue Princess Zelda. Link… You must save Princess Zelda. I guess all this is to say that since the GBA developers clearly had no qualms with changing gameplay mechanics, dungeon layouts, audio clips, and even important and famous dialogue, it’s no surprise that a little old cane got changed too. The question remains, though: why did the cane get its name changed? Who made the decision, and why? If it wasn’t an out-of-control typo, it seems like such a random thing to rename out of everything else. 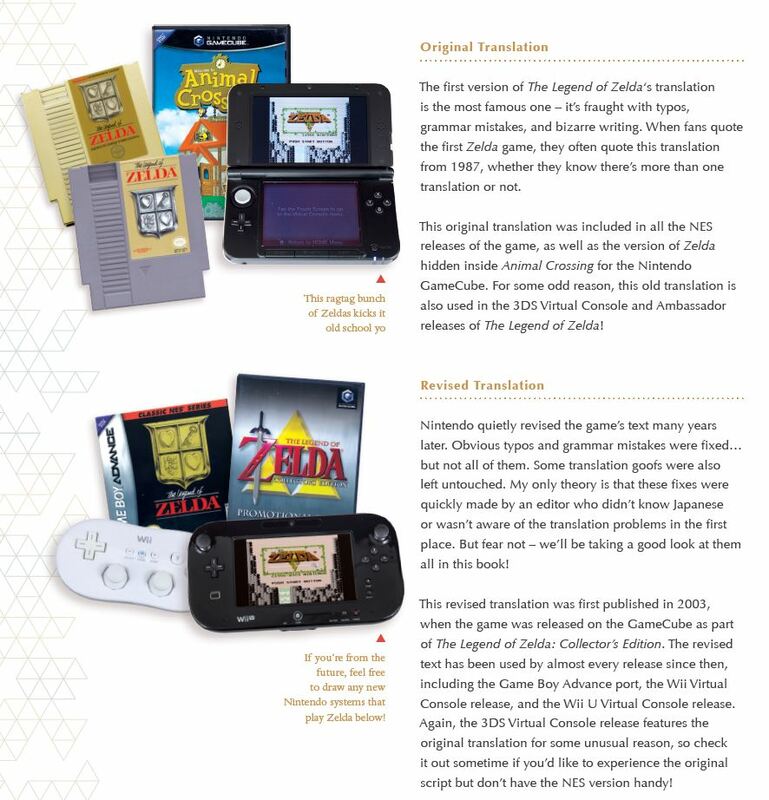 And why was it only changed in Nintendo’s official guide too? So although there’s still no answer to these mysteries, it’s been a weird ride trying to solve it. 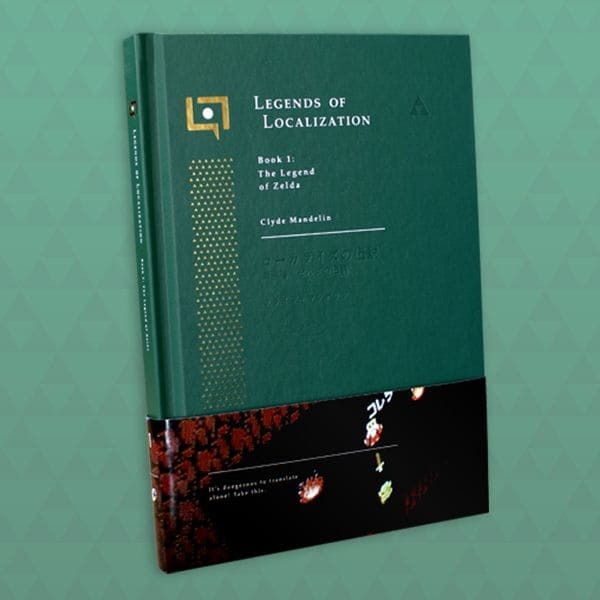 At the very least, I hope it’s been an entertaining look at how detailed my professional work and my Legends of Localization research is behind the scenes. And if you have any ideas, theories, or leads of your own, definitely share them in the comments or on Twitter. Who knows, maybe someday I’ll get to update this article with the final answer! If you enjoyed this inside look at my game research process, you'll like the time I used an old computer to confirm a rumor about kangaroos and the time I uncovered 32 secret endings in Japanese Zero Wing! This is fascinating–thank you! 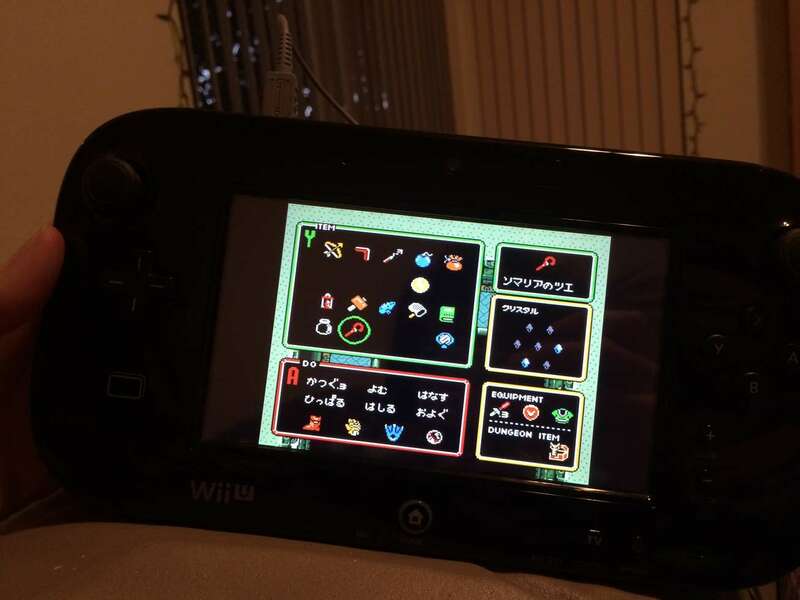 I have a Japanese New 3DS *and* the Virtual Console version of LTTP, though I haven’t played it much; when I get to that part in the game, I’ll report back (unless someone beats me to it). Maybe it’s something as simple as this: when they prepared the GBA remake, the list of items was re-created first (like a master list) and this is where the typo replacing Somaria with Somasoa happened; since it’d be on a master list, this error would be replicated whenever it’s mentioned in the game as well as the official Nintendo guide, while everywhere else (virtual console ports and unofficial GBA guide) would retain the Somaria original. 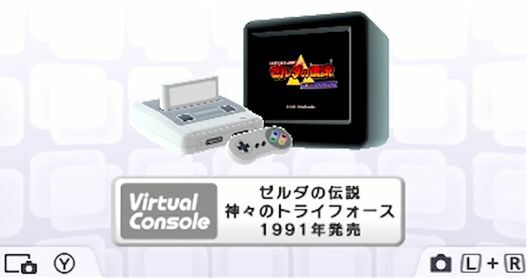 I think it’s the most likely explanation because I’m sure that otherwise, Nintendo would have modified the Virtual Console’s ROM to use Somasoa instead. I am more inclined to believe that it was a persistent typo in the GBA version; I’ve had words that I’ve constantly spelled wrong for months, years even, without noticing, and that’s just in English. 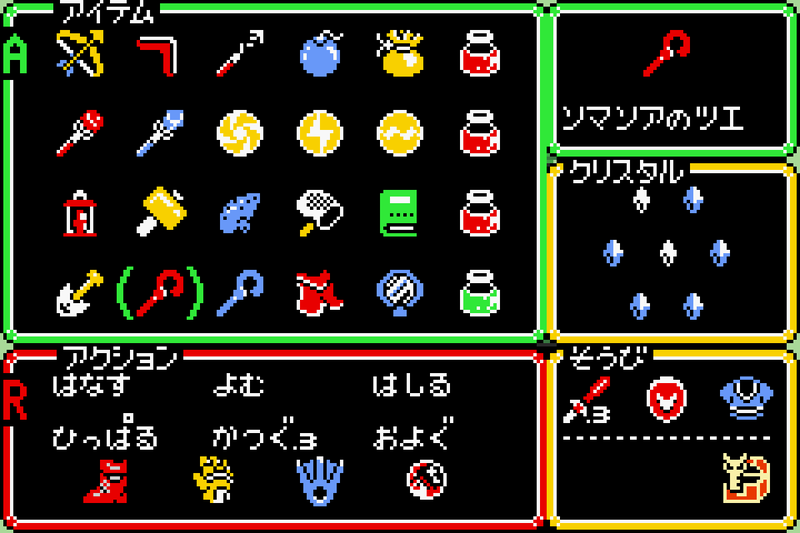 Given the strikingly close resemblance between the “ri” and “so” katakana characters, I’m just under the impression that there was one relatively new guy in charge of inputting the GBA version’s text into the game proper, made the “Somasoa” typo, and didn’t realize it was wrong. 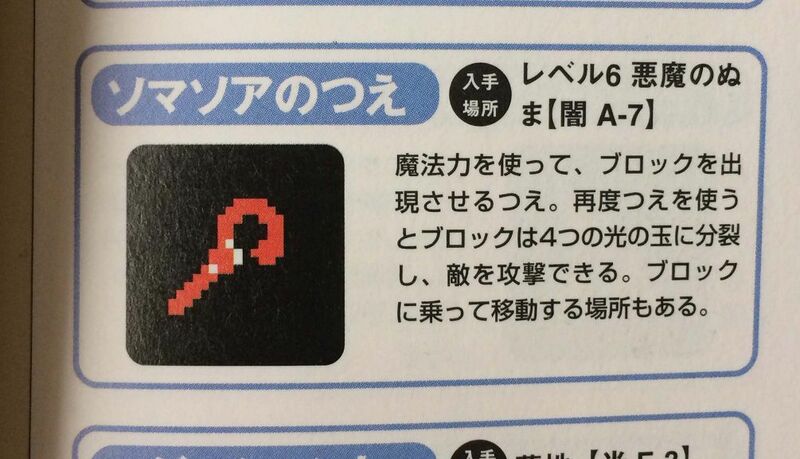 As for why the typo would appear in the official strategy guide, my guess is whoever wrote that wasn’t familiar enough with the SNES version to know that the item name was originally the “Cane of Somaria”, or just thought that “Somaria” was the erroneous version and “Somasoa” was the proper version. I, too, feel the Somalia theory is weak, but I think the strongest case for it would be the notoriety of Somali pirates during the mid-2000s rather than the war-torn nation itself. I’d say it’s fairly likely the reason the unofficial guides called it the Cane of Somaria is because they were written by people that were already familiar with the game and knew the item by its original name, so they just didn’t pay enough attention to the in-game text to notice that tiny little spelling change. It’s such a minor change it’s easy to miss. From what I understand, the strategy guide makers are given pre-release builds of the game to work on. Most of the time these builds are final, but sometimes the developers make a couple of last-minute changes before release. If “Somasoa” was a deliberate change made at the last minute to avoid the possible “Somalia” interpretation, it makes sense that the official Nintendo guide has the change and the unofficial guides don’t. 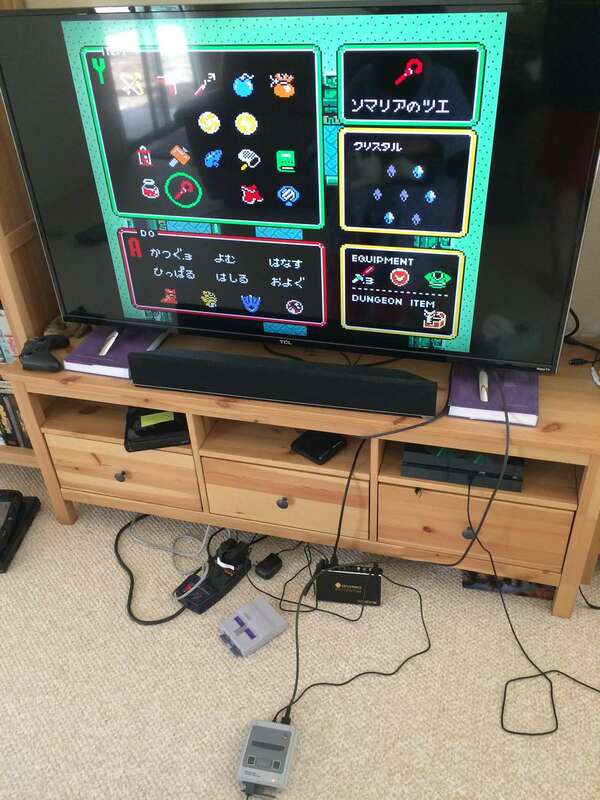 While I don’t expect any surprises, you might also want to check out the Japanese ROM of the Satellaview games – both the Satellaview re-release of LttP, and the Satellaview-only Ancient Stone Tablets. 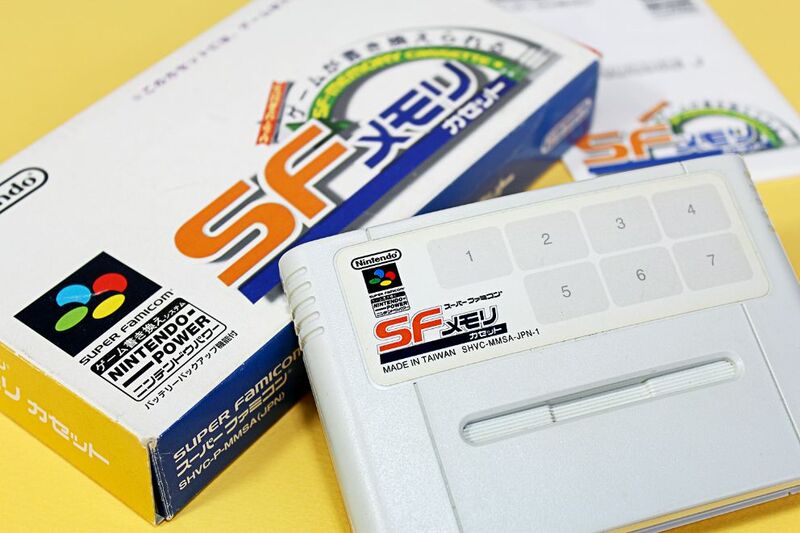 Oh cool, I forgot that it got re-released on Satellaview. Of the few games I’ve played on it it seems like the ROMs were incredibly hacked up by fans and finding clean Japanese dumps was super tough. That was a few years ago though, so maybe I’ll give the scene another look. Regarding Ancient Stone Tablets, I hadn’t investigated thoroughly, but back when I attempted to play a supposedly unpatched version, it displayed glitched graphics and was in a soft-lock state. Basically, it half-started a new game but skipping the naming process and dumped you in a half-initialized starting room. I’m guessing the original dumps were in such a bad state that they are unplayable without hacking, but I can’t say for sure. That or Satellaview isn’t 100% compatible with emulators, but that seems unlikely in the case of bsnes/higan. Or, maybe the “original” dump was hacked in such a way to make it compatible with emulators of the time, such as the notoriously buggy ZSNES. 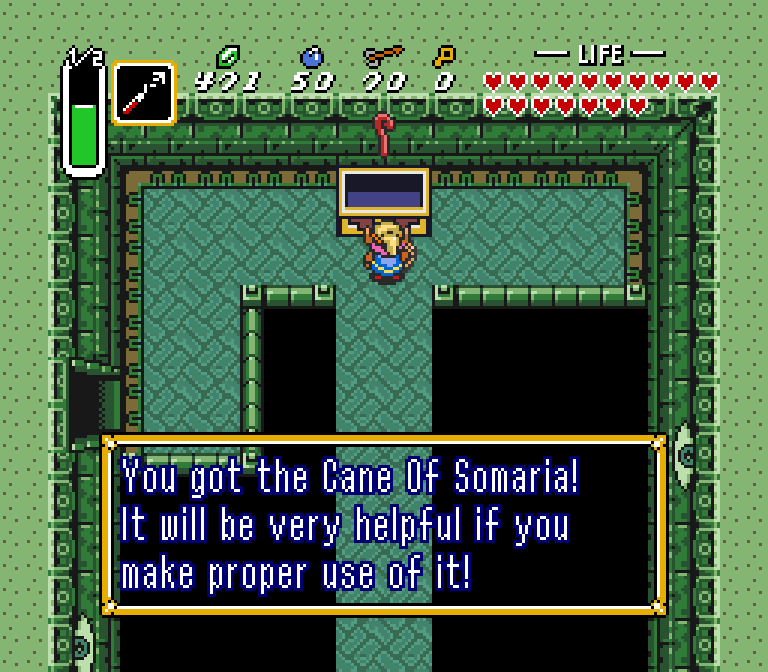 For what it’s worth, the Cane was indeed referred to as the Cane of Somaria in Oracle of Ages, which was released in 2001. The subsequent question would be: what about the Japanese version? Also, a question regarding the article… my memory might be hazy, but I thought there was a complex puzzle in the Ice Palace that you could more or less bypass if you used the Cane of Somaria to create a block instead (assuming you chose to complete the Misery Mire dungeon first). 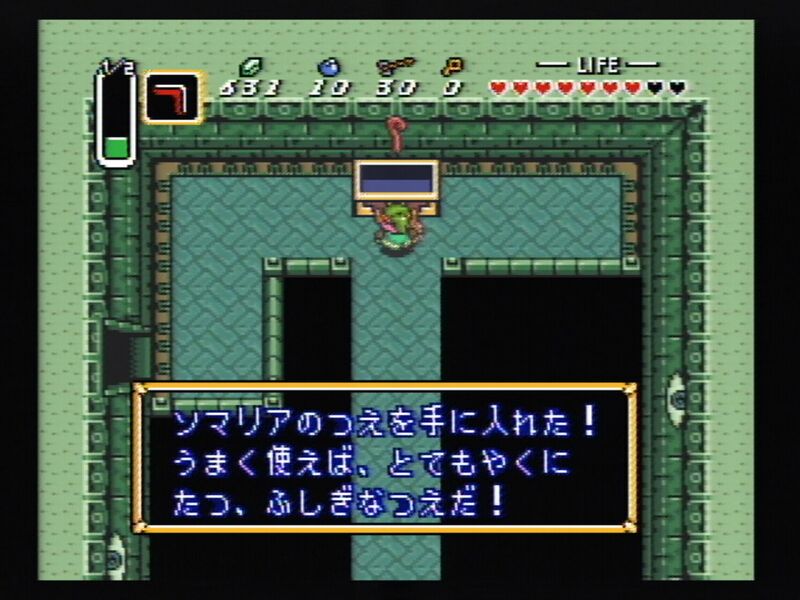 However, when replaying the GBA port of a Link to the Past a few years ago, I didn’t encounter any block-related puzzle in which the Cane of Somaria would have come in handy. 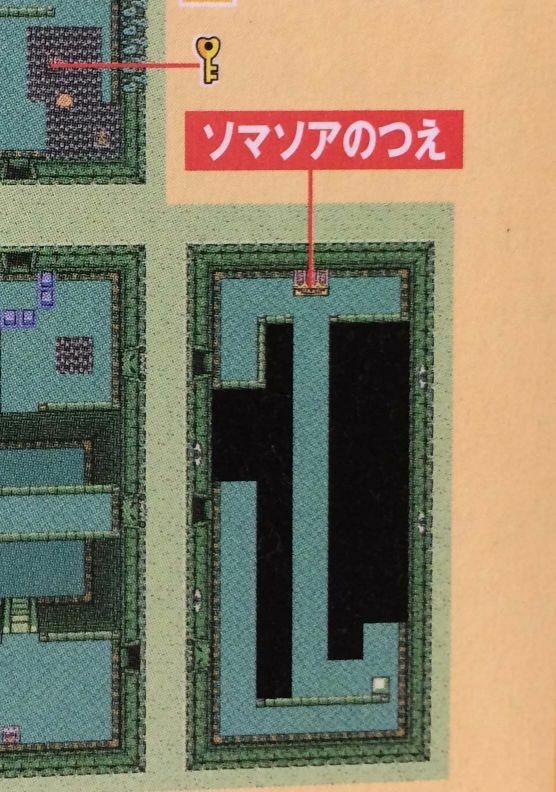 Could this be due to the change in dungeon layout that the Ice Palace received for the GBA port? Then again, I haven’t played the original SNES version in over a decade, so once again I could just be misremembering things. Yes. The two rooms that were changed eliminated that entire puzzle. As you can see, the Cane of Somaria can clearly be used to create a block for that button you have to hold down, eliminating the need to drop one down from the floor above. Cool, thanks for the insight! Nice to have clarification on that one. 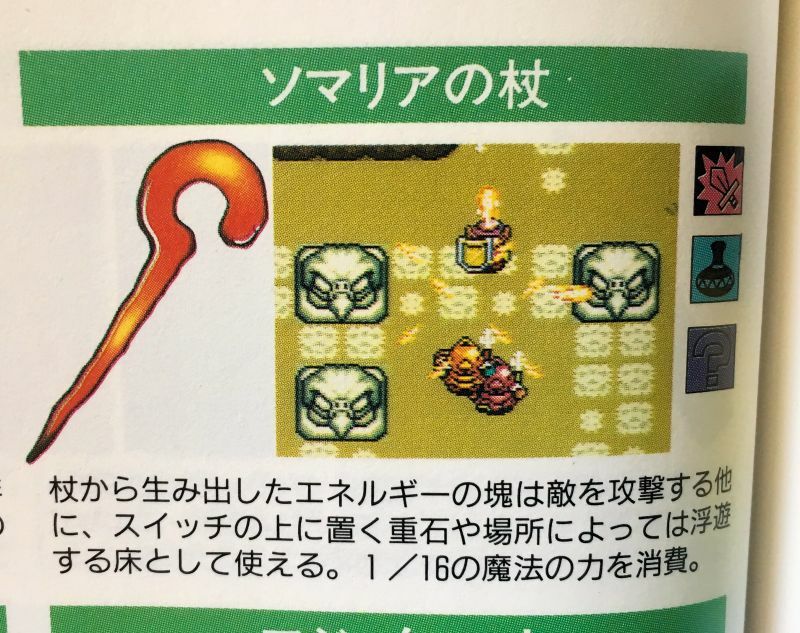 Regarding that screenshot after beating the GBA-only dungeon, was the Cane of Byrna always called the Cane of Byra in Japan, or is that a whole other can of worms to open up? Yep, it’s always been Byra, I guess it got changed to Byrna for the SNES localization. I have the Japanese New 3DS VC version and I can confirm it is Somaria there. Do all the re-releases have new cedits to name the new staff? Might be interesting to see if any of the same or different people worked on the different versions. I’m reminded of how the Transformers character Metroplex is apparently called Metroflex in Japanese, and having thought that that could have possibly originated from a mistake (like perhaps at some point somebody wrote it down and somebody else misread their handwriting). 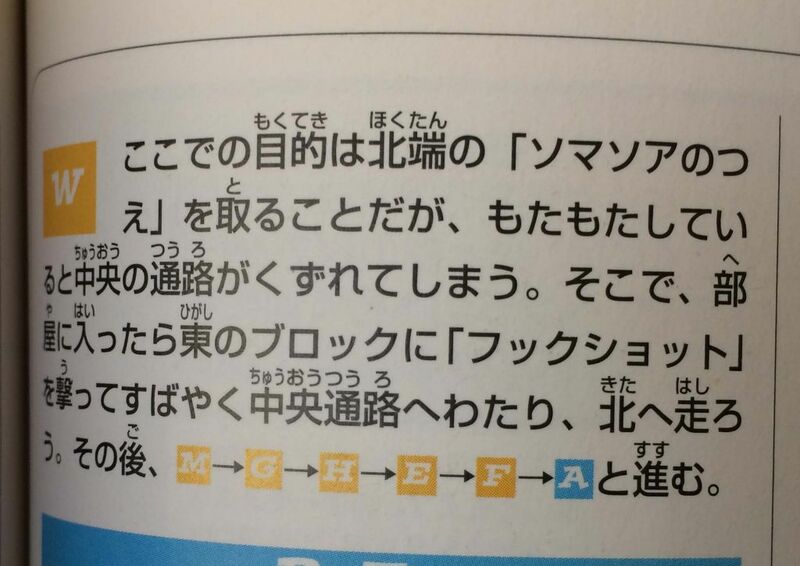 Although it could just as well have been an intentional name change, but it seems like such a minor difference and when written in katakana the difference visually would just be the presence/absence of a single small mark next to one character, so it does seem plausible it could have originated as a mistake. 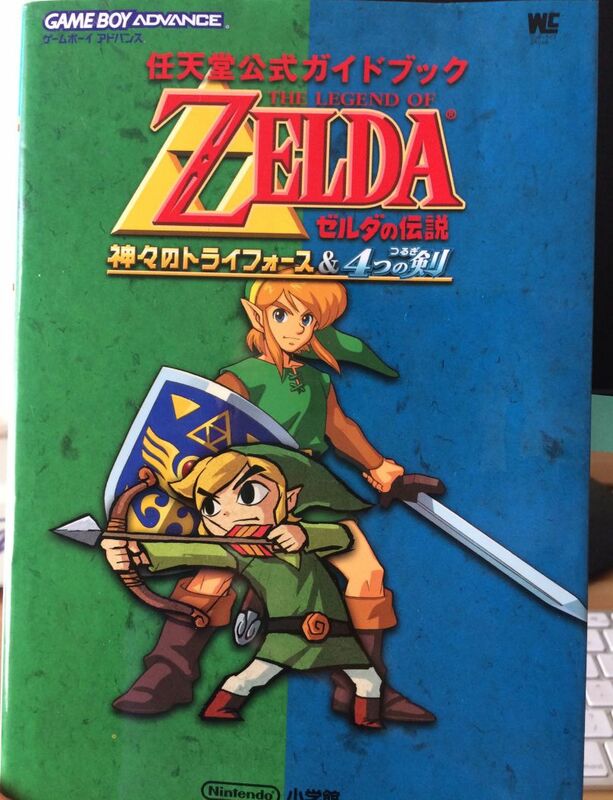 I think I have an English guide for the GBA version at home I can check, though I forget if it’s official or Prima. Though I feel like I would remember it not saying Somaria…Can’t hurt to look, though. So, I checked my guide (which is an official Nintendo Power guide) and it’s still called Somaria. I can grab some pics if you want, but I assume the fact that they use the expected name is not too exciting. I wonder if there are fans out there who insist that “Somasoa” is the correct name, even though the “change” has been reverted in every subsequent version. I wouldn’t be surprised; people seem reluctant to accept that Official Sources can have mistakes or typos, for some reason.